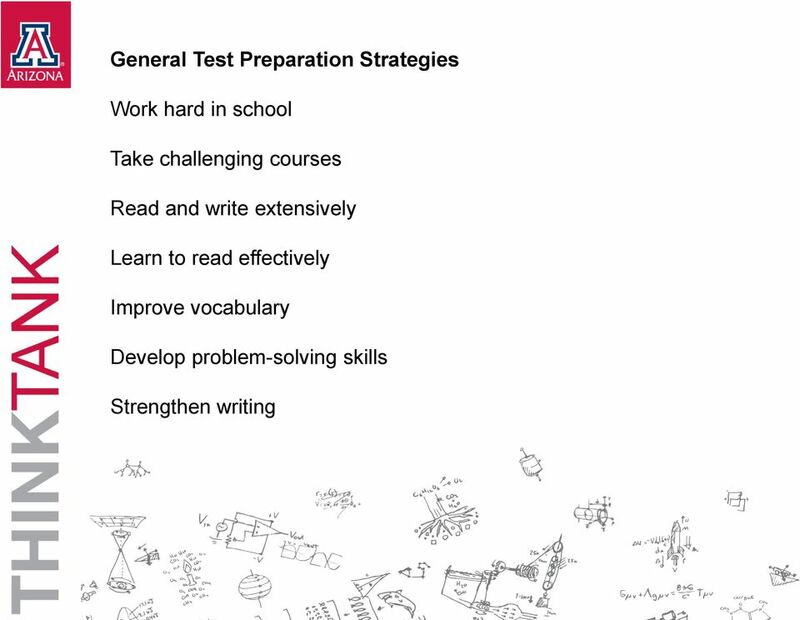 Review test prep resources for educators, students and families. Download "Review test prep resources for educators, students and families." 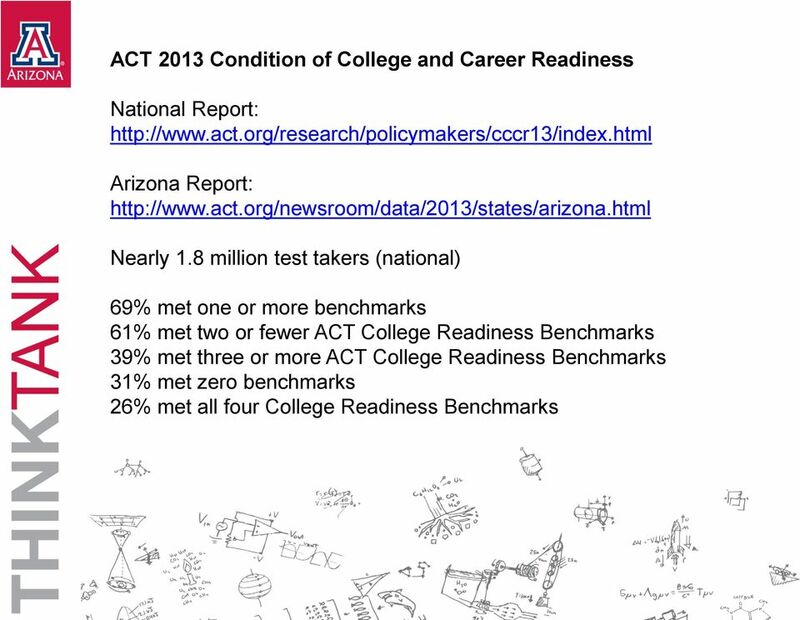 2 Goals: Discuss findings of the 2013 SAT Report on College and Career Readiness and the ACT 2013 Condition of College and Career Readiness; examine performance data to see how Arizona students are testing. 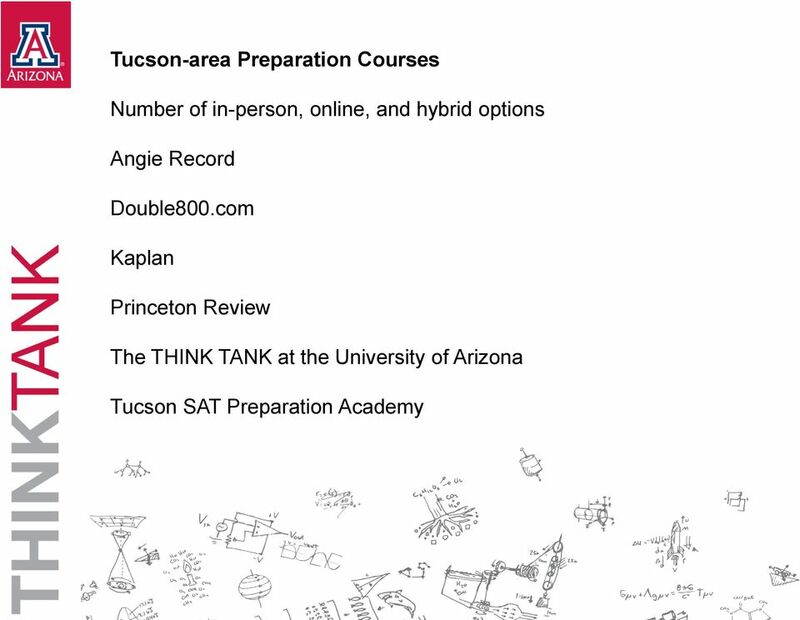 Review test prep resources for educators, students and families. 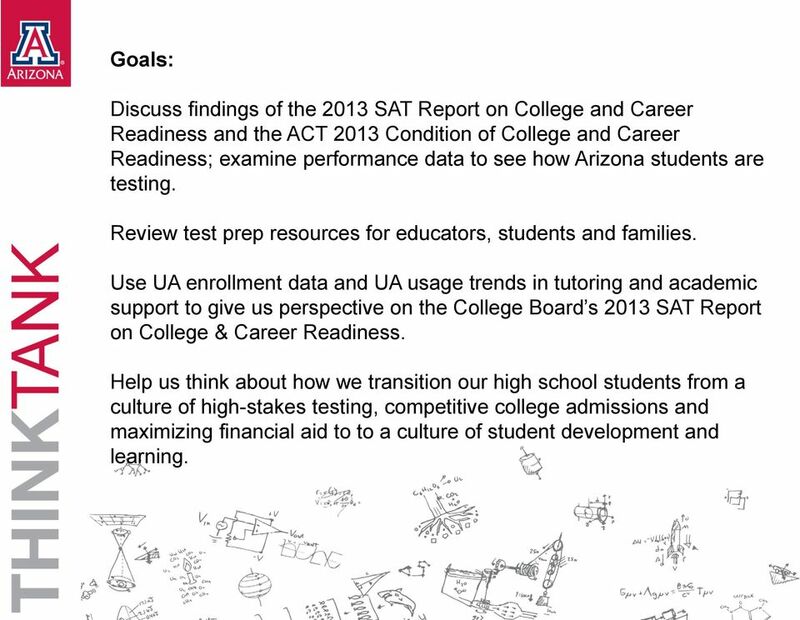 Use UA enrollment data and UA usage trends in tutoring and academic support to give us perspective on the College Board s 2013 SAT Report on College & Career Readiness. Help us think about how we transition our high school students from a culture of high-stakes testing, competitive college admissions and maximizing financial aid to to a culture of student development and learning. 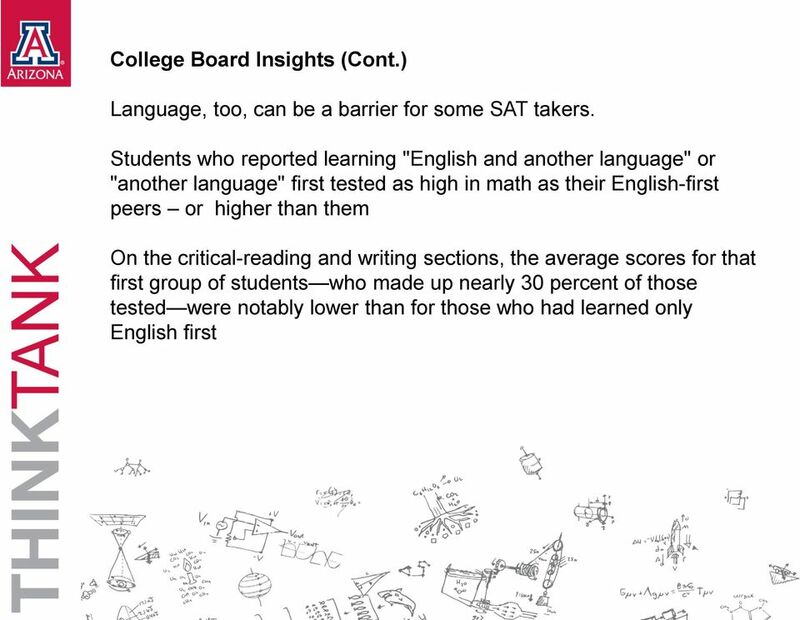 6 College Board Insights (Cont.) Critics of standardized tests contend that the examinations are unfair to students from low-income backgrounds. 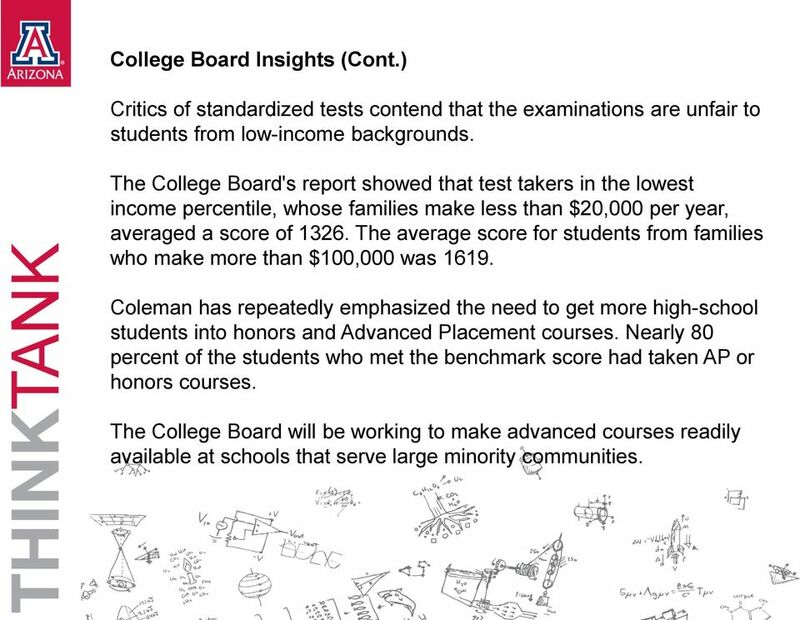 The College Board's report showed that test takers in the lowest income percentile, whose families make less than $20,000 per year, averaged a score of The average score for students from families who make more than $100,000 was Coleman has repeatedly emphasized the need to get more high-school students into honors and Advanced Placement courses. 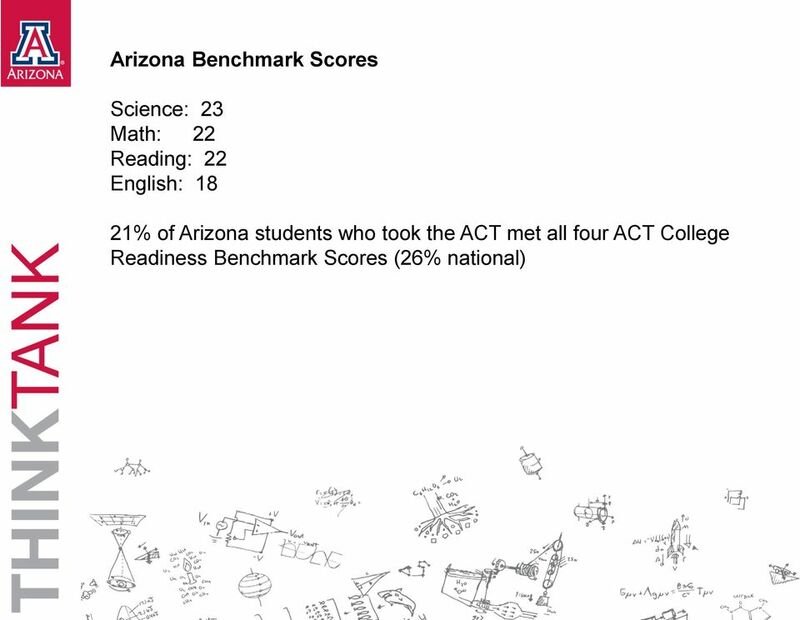 Nearly 80 percent of the students who met the benchmark score had taken AP or honors courses. The College Board will be working to make advanced courses readily available at schools that serve large minority communities. 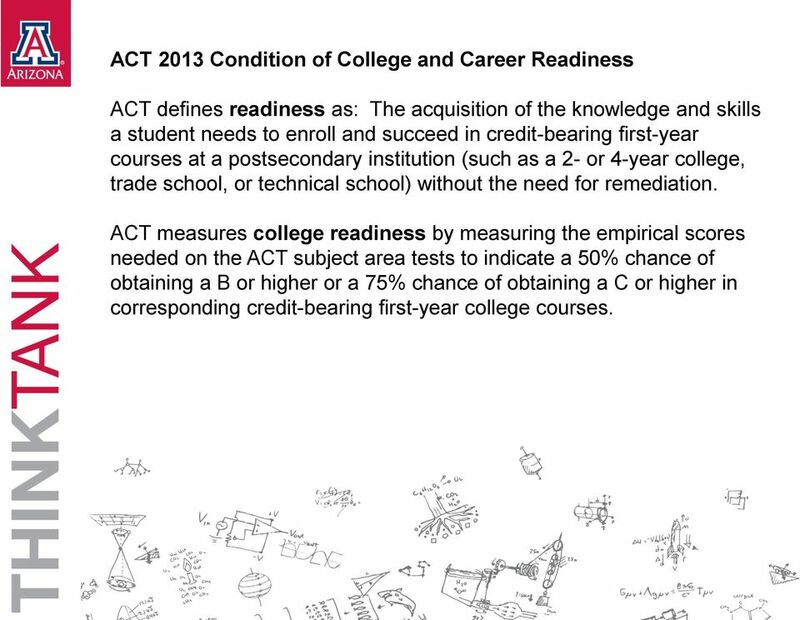 10 ACT 2013 Condition of College and Career Readiness ACT defines readiness as: The acquisition of the knowledge and skills a student needs to enroll and succeed in credit-bearing first-year courses at a postsecondary institution (such as a 2- or 4-year college, trade school, or technical school) without the need for remediation. 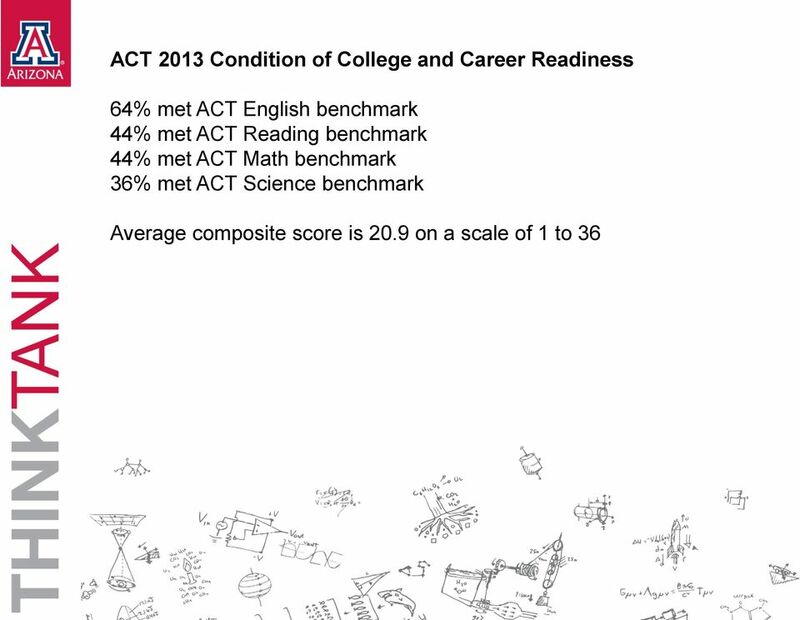 ACT measures college readiness by measuring the empirical scores needed on the ACT subject area tests to indicate a 50% chance of obtaining a B or higher or a 75% chance of obtaining a C or higher in corresponding credit-bearing first-year college courses. 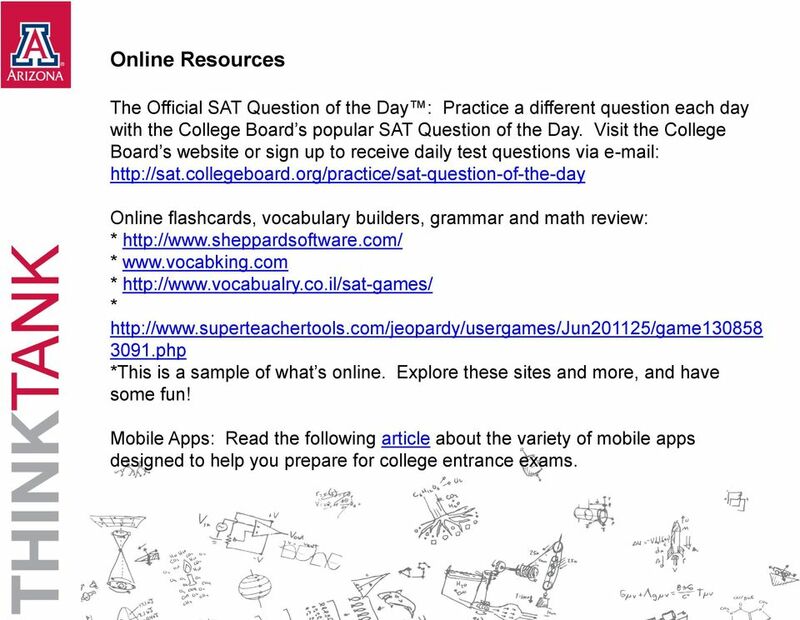 15 Online Resources The Official SAT Question of the Day : Practice a different question each day with the College Board s popular SAT Question of the Day. Visit the College Board s website or sign up to receive daily test questions via Online flashcards, vocabulary builders, grammar and math review: * * * * php *This is a sample of what s online. Explore these sites and more, and have some fun! Mobile Apps: Read the following article about the variety of mobile apps designed to help you prepare for college entrance exams. 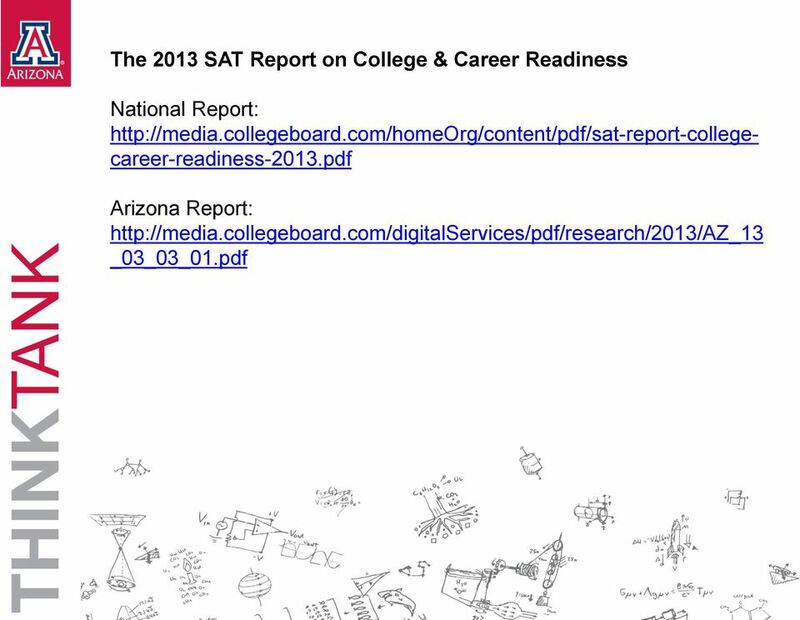 18 From the Executive Summary of the 2013 SAT Report on College and Career Readiness: The College Board s 2013 SAT Report on College & Career Readiness reveals that fewer than half of all SAT takers in the class of 2013 graduated from high school academically prepared for the rigors of college-level course work. With our country struggling to compete in the global marketplace and with millions of skilled jobs left unfilled there is a heightened focus on understanding how our students are performing academically and in ensuring that they are college and career ready. 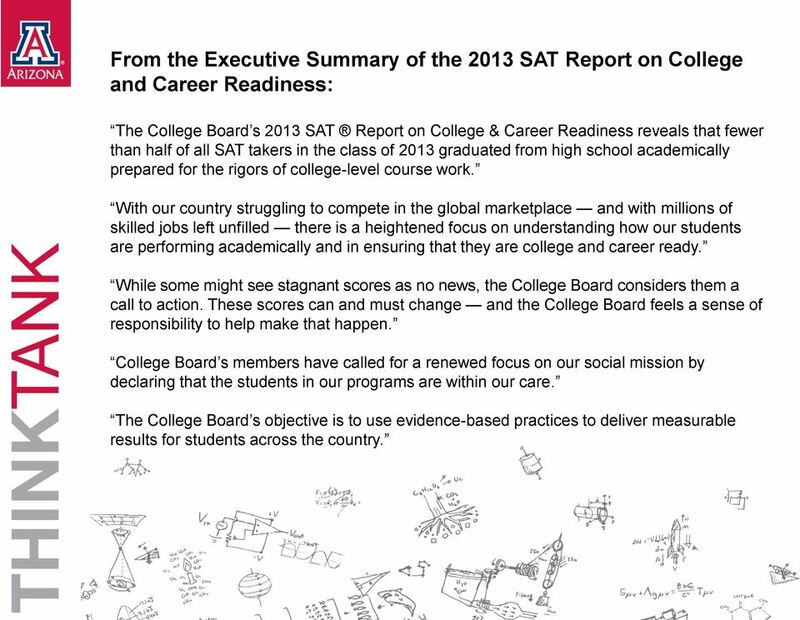 While some might see stagnant scores as no news, the College Board considers them a call to action. 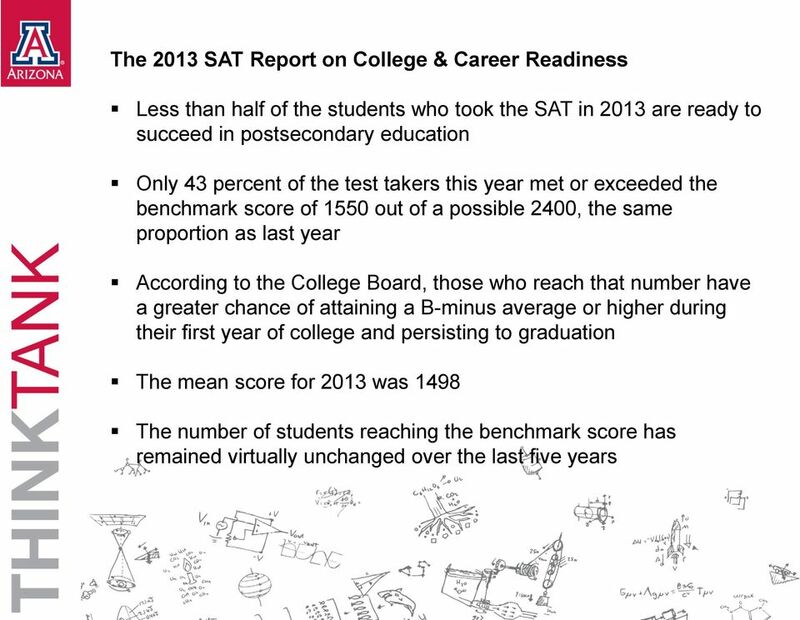 These scores can and must change and the College Board feels a sense of responsibility to help make that happen. College Board s members have called for a renewed focus on our social mission by declaring that the students in our programs are within our care. 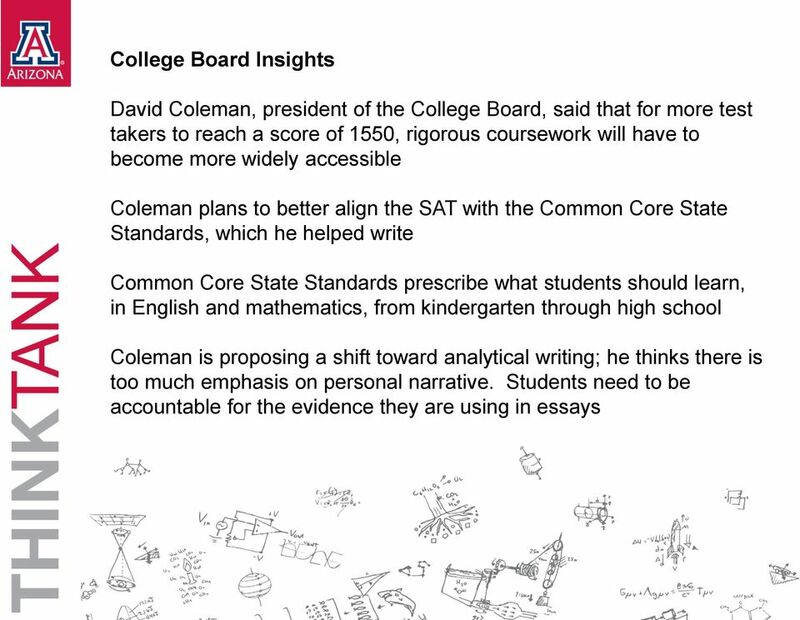 The College Board s objective is to use evidence-based practices to deliver measurable results for students across the country. 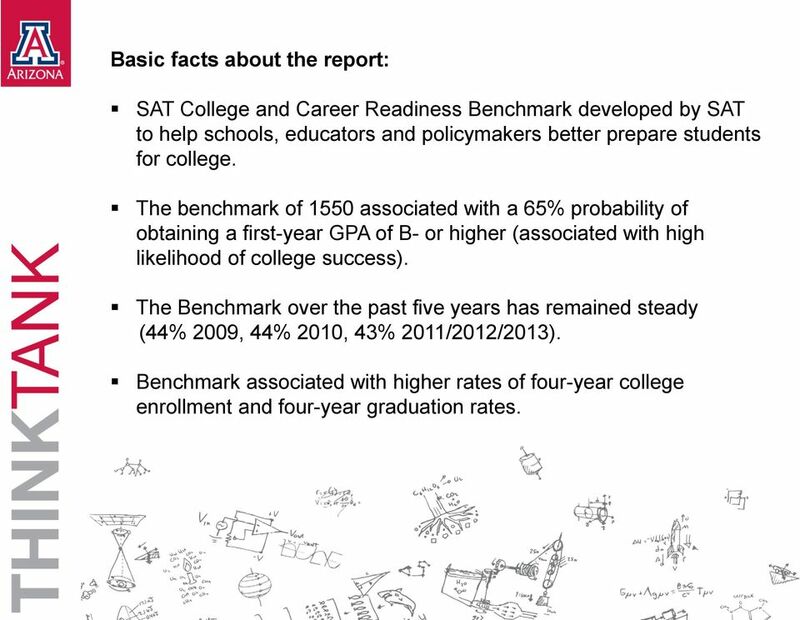 19 Basic facts about the report: SAT College and Career Readiness Benchmark developed by SAT to help schools, educators and policymakers better prepare students for college. The benchmark of 1550 associated with a 65% probability of obtaining a first-year GPA of B- or higher (associated with high likelihood of college success). The Benchmark over the past five years has remained steady (44% 2009, 44% 2010, 43% 2011/2012/2013). Benchmark associated with higher rates of four-year college enrollment and four-year graduation rates. 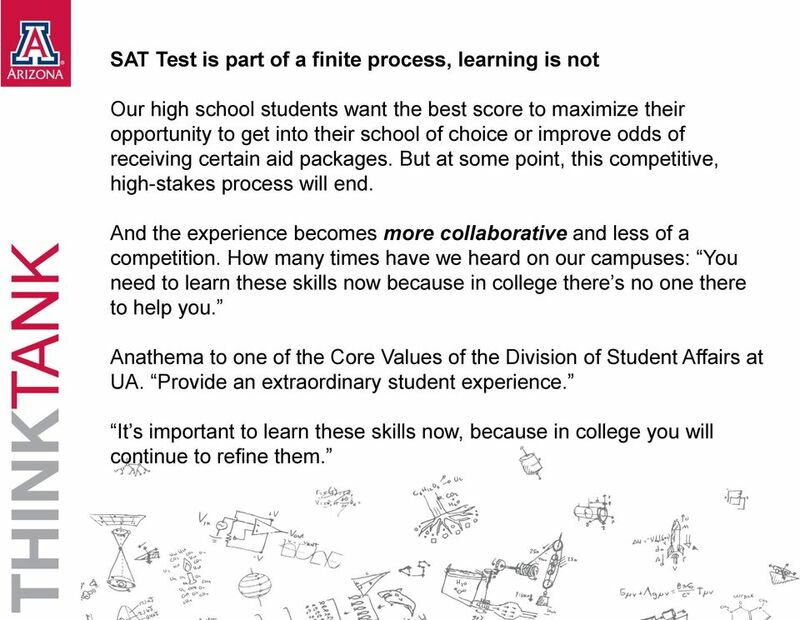 20 SAT Test is part of a finite process, learning is not Our high school students want the best score to maximize their opportunity to get into their school of choice or improve odds of receiving certain aid packages. But at some point, this competitive, high-stakes process will end. And the experience becomes more collaborative and less of a competition. How many times have we heard on our campuses: You need to learn these skills now because in college there s no one there to help you. Anathema to one of the Core Values of the Division of Student Affairs at UA. Provide an extraordinary student experience. It s important to learn these skills now, because in college you will continue to refine them. 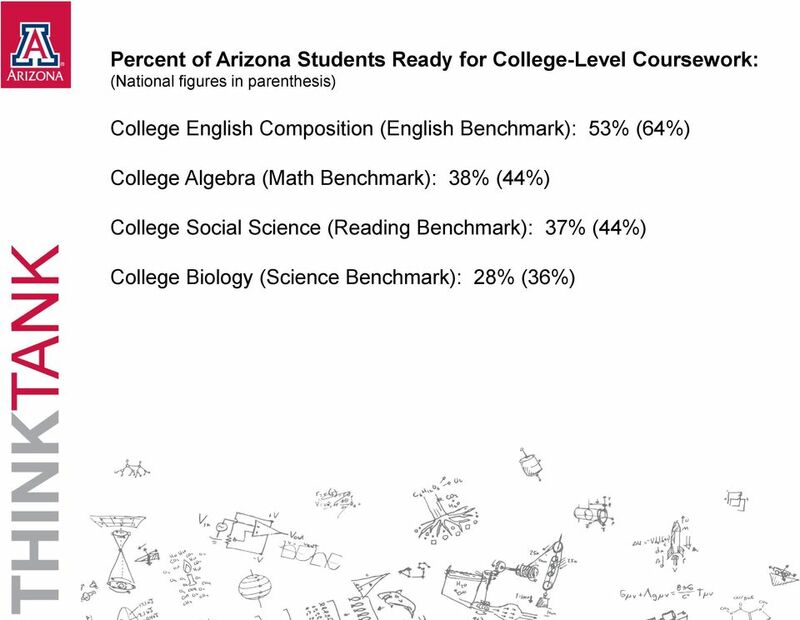 21 What we know about the entering class of 2013 (Source: UA Office of Institutional Research) Full Time Mean SAT score 1114 Full Time Mean H.S. 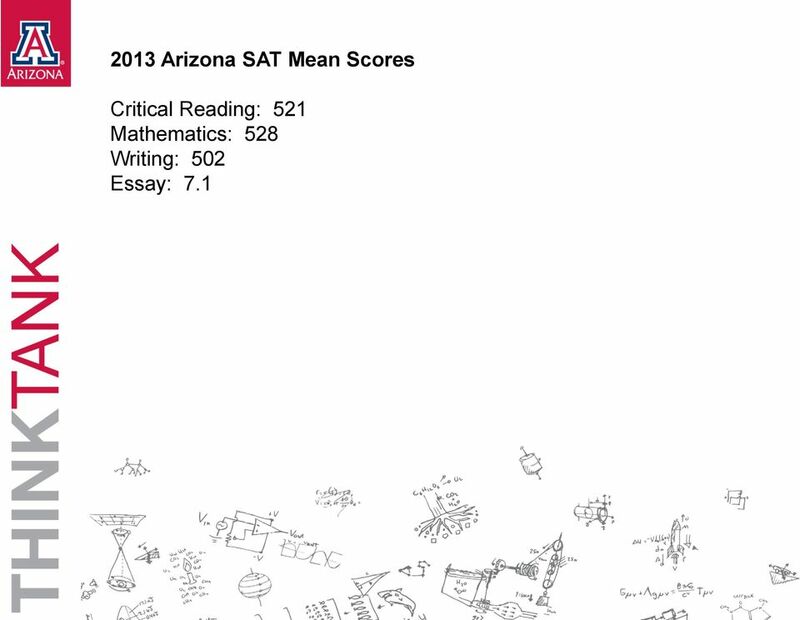 GPA 3.40 Mean SAT score w/writing 1657* *Mean SAT score w/writing is used only for purposes of this analysis. 26 May we suggest Data is out there to inform our students, high school academic and counseling departments, families and communities. High school and middle school counselors can use test performance data and other metrics to better support students. Higher ed. also uses this data to inform practices and better support students. 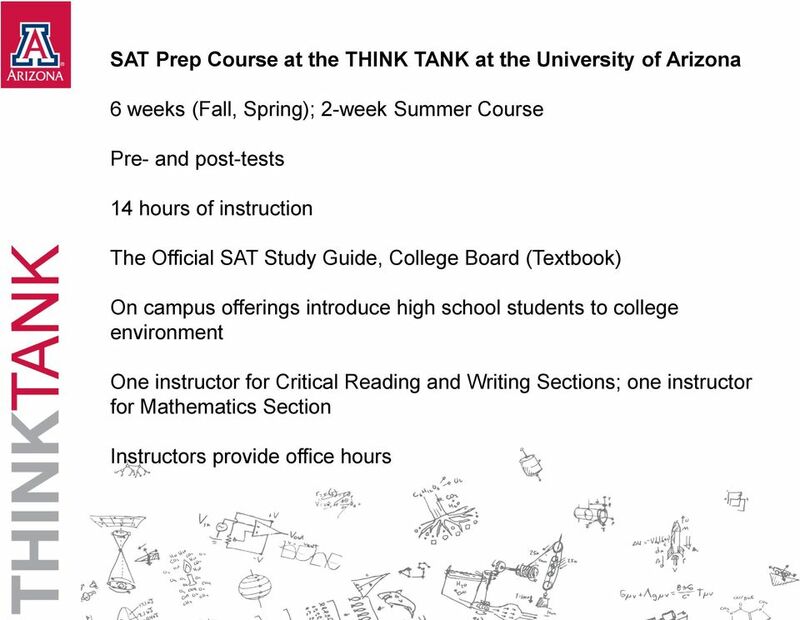 These tests are only one component of the college application process. 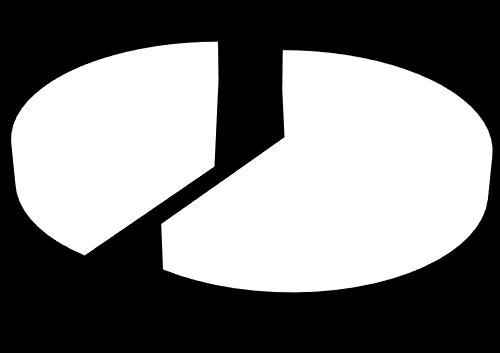 Student development theory offers a more nuanced picture of the high school to college transition and the college experience; test scores alone should not dissuade students from pursuing college and career opportunities. We all have a vested interest in student success. College Report National ACT is an independent, nonprofit organization that provides assessment, research, information, and program management services in the broad areas of education and workforce development. How do we define college and career readiness? A Comparison of the College Outcomes of AP and Dual Enrollment Students In Progress. Jeff Wyatt, Brian Patterson, and F.